Preheat oven to 400° F . Line 12 muffin cups with paper liners. Melt the butter in a saucepan allow to continue to cook until it browns gently. Browning the butter will happen suddenly and spread quickly, so don't leave the stove during this time. Remove from heat immediately and let cool for 10 minutes. In a large bowl, beat the egg. Beat in milk and butter until well combined. Stir in flour, sugar, baking powder and salt until just moistened. Gently fold in vanilla, raspberries, blueberries and apples. Divide the batter evenly between the muffin cups -- I like to use an ice cream scoop for this step. Bake for 22-26 minutes, until tops are golden brown and a toothpick inserted in the center pulls out clean. Let muffins cool until they can be touched. How do you like your muffins? I love mine to be soft and airy on the inside with a crisp crust. They can't be too sweet, and are even better if they are packed with fruit -- a mix of sweet and tangy. And I like them served warm. These Apple Berry Muffins are all that. 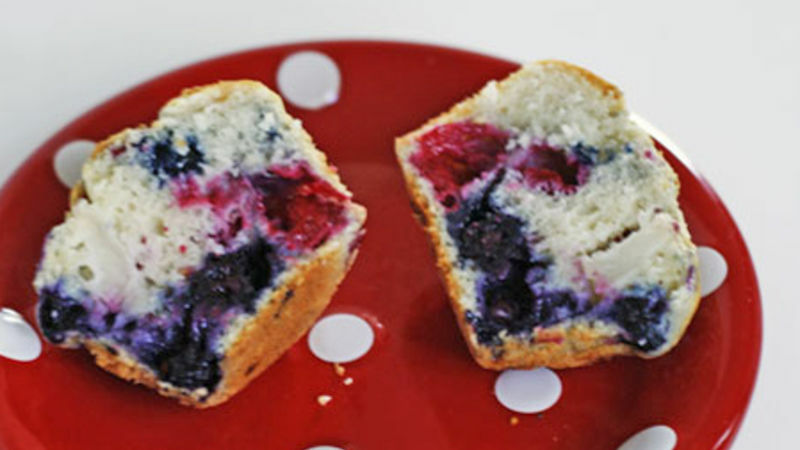 They combine tart raspberries, sweet blueberries and moist apples in a fluffy muffin that is fabulous served right from the oven. And the brown butter in the recipe really gives them a fabulous, gentle nuttiness (without adding nuts, of course). My daughter, who is almost 3, adores these muffins because they aren't overly sweet. Although she normal will only eat a little of something like this, the gentle sweetness makes her ask for "More, please!" And hey, I am happy to oblige. Making muffins from scratch might sound complicated, but really it's not. The batter, which is similar in technique and difficulty to homemade pancake batter, mixes up quickly and easily in one bowl. Then you spoon it into a 12-muffin cup tin. I like to use an ice cream scoop to fill the cups. The one I use has the lever to push the contents out of the scoop. Once they are cooked (it takes about 23 minutes), let them cool slightly and then serve immediately. Or, store in an airtight container once cooled and serve within 7 days. Sarah W. Caron is a food writer, editor and blogger who writes about family-friendly foods and raising a healthy family at Sarah's Cucina Bella.